This top is easily the best $17 I’ve ever spent. You read that correctly. SEVENTEEN DOLLARS. This time of year I always find myself in a bit of a rut, style-wise. By this time, I’ve already worn and re-worn my favorite spring/summer acquisitions a ton of times, so I start to get bored with my wardrobe. I have no interest in spending more money on summer clothes though, because I’ll soon be transitioning into fall items (lighter ones, since I live in Texas). So that either leaves me with wearing the same things yet again, or buying some cheap, fun pieces to keep my wardrobe exciting and change it up for the rest of summer. I recently discovered SheIn (SheInside – no idea what that actually means), and ordered a bunch of dirt cheap pieces to see what the quality was like. All of the items are made in and ship from China, so the quality/fit of the items is seriously a toss-up. I ordered six items, and was super surprised to find that four out of the six pieces fit me perfectly and look adorable! The fabric isn’t of the highest quality – it’s pretty thin, which is actually ideal in this heat. If I were shopping for winter items, I might complain about that. On one of the dresses I received, the dress part fit nicely, but the sleeves were the size of my wrists – the size of a small child’s arm! The other dress that didn’t work was too tight in the hips – I may just give it to my intern. It would make a cute coverup! Because you are responsible for return shipping to China, it’s cheaper for me to just eat the $25-30 on the dresses that didn’t work, rather than ship them back. I totally agree with you! My mind is totally on fall and there is no point to buying summer clothes anymore. 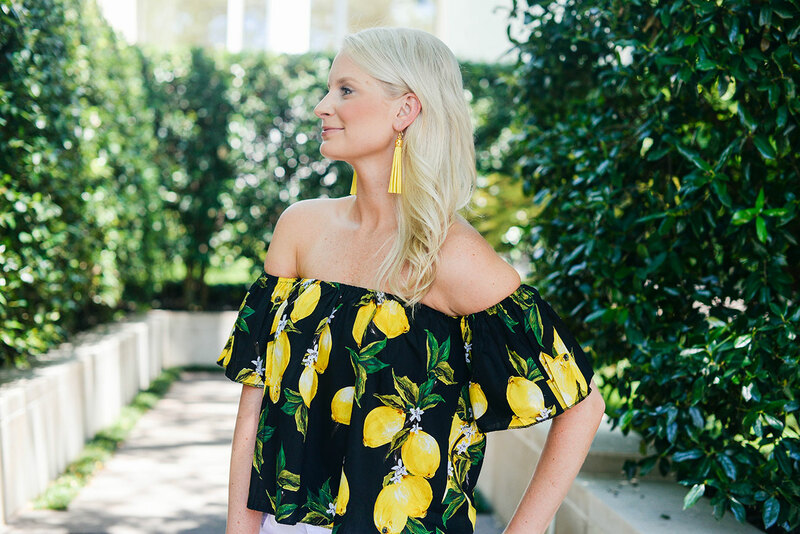 Love this top on you – so fun! How long did shipping take? I heard it can take quite some time. Also, did you order your regular size in most pieces or size up? I have been hesitant to purchase anything but a lot of their off-the-shoulder tops and dresses look so cute! It took a little over a week to get to me – I just ordered a medium in everything (this top was “one size” though). Most of it fit me just fine! I love this store – I bought a super cheap cotton off shoulder blouse at Shein and it’s such good quality! Love your look! I’ve found a few fun, trendy pieces from shein and have been pleasantly surprised at how often I wear them. 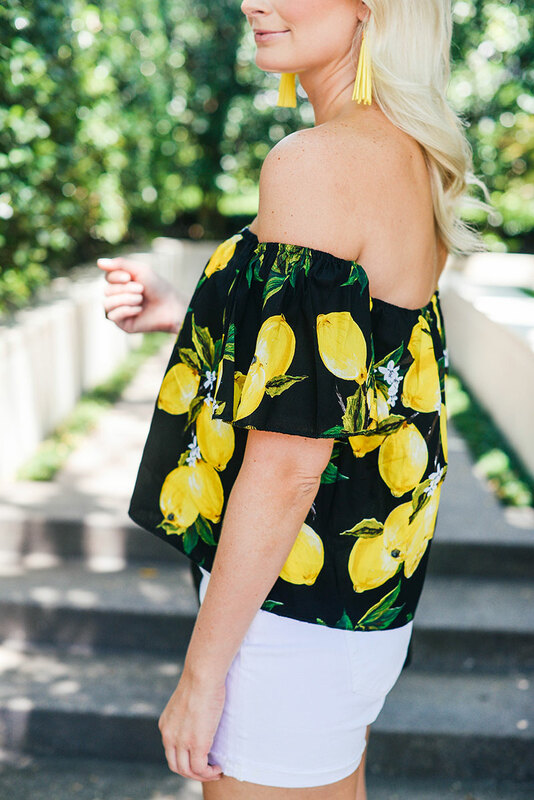 This little lemon top was a major score, so cute! 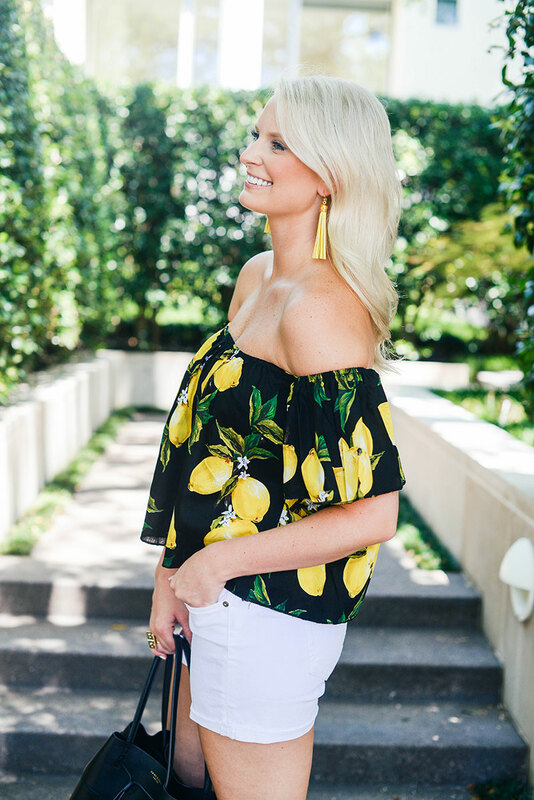 I am in love with this lemon yellow accented look! I’ve had some issues with SheIn before, but I might need to try them out again. Oh how I agree! I’m soooo tired of my summer clothes and since I live in Arizona, I too am going to have to wait for awhile before I can wear “real” fall outfits. That’s why I’m off to Zara this afternoon! :) Love your top, it’s perfect and the darker piece takes it from being too summery! Great find! 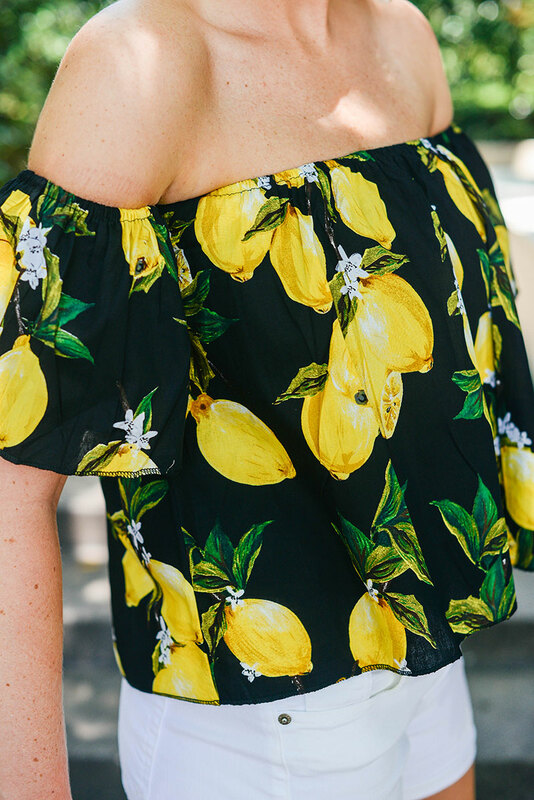 I’ve been obsessed with anything and everything lemons lately! Such a cute top and espadrilles! Goodness Merrit, this blouse is a steal! The colors and print are AH-mazing! Annnd can I please have those espadrilles in my life?! This top is so cute, I need it! This top was only 17? I cannot believe it! It is so chic and looks perfect on you, loving the look! This is such a great find! I can’t believe it’s only $17!! That’s amazing! I haven’t tried SheIn yet but I’m liking what I’m seeing from everyone! Omg your blog is too good. I love it!! Stunning outfit and photographs dear, you look gorgeous! Have a wonderful day. This top is fabulous, like the pattern.